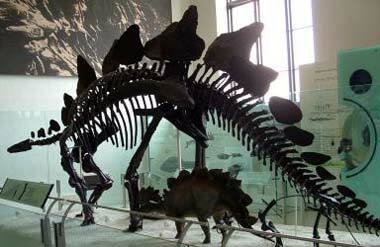 Photo of stegosaurus mother and child fossils © Karen Vaughn (used by permission). 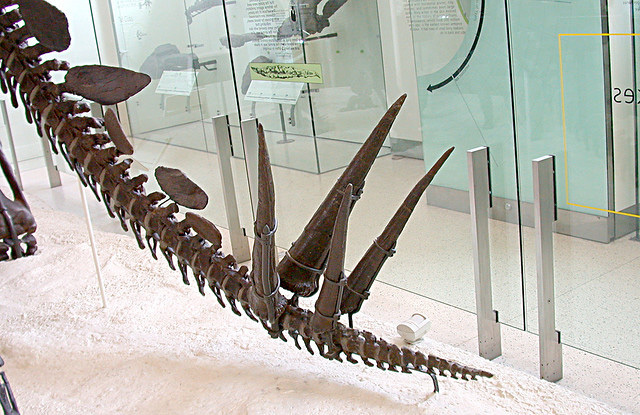 The Denver Museum of Nature & Science displays a stegosaurus fossil skeleton that was discovered by Canon City High School students and teacher. Stegosaurus (which means "roofed lizard" or "covered lizard") was a large herbivorous dinosaur that lived in the area now called Colorado 150 million years ago (mid-Jurassic to the late Cretaceous period). An incredibly successful dinosaur that survived for tens of millions of years; fossils of stegosaurus have been found in western United States, Europe, Africa, and Asia. 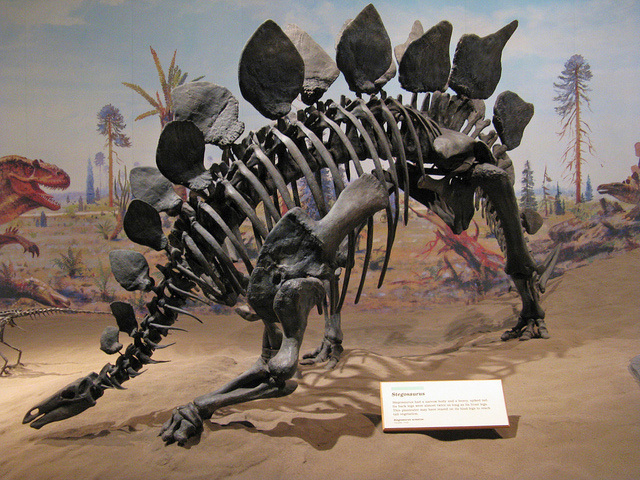 In addition to the distinctive bony plates that formed a defensive ridge along the dinosaur's back and tail, stegosaurus had a unique and deadly defense against predators with its spiked tail, which it could apparently wield with great dexterity and accuracy. Besides providing armor, the plates are also thought to have possibly helped with regulating body temperature, and could have been used as a display (turning colors as a warning to predators and as part of its mating ritual). Though it is believed to have weighed up to 10 tons, stegosaurus had a tiny brain in its head - about the size of a walnut. But stegosaurus is thought to have possibly had a second brain in its hindquarters (and that second brain might have been the larger of the two). Stegosaurus tail fossil; photo by Steve Lew on Flickr (noncommercial use permitted with attribution / share alike). Stegosaurus; photo by Travis on Flickr (noncommercial use permitted with attribution). 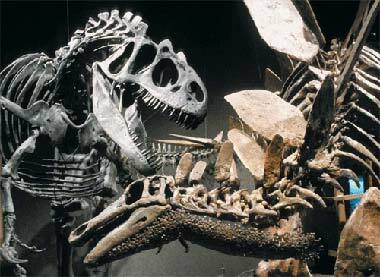 Stegosaurus and T-Rex fossils photo © Colorado Geological Survey (all rights reserved; used by permission).